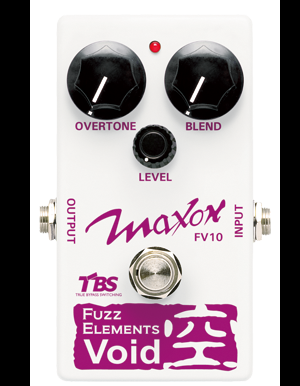 Fuzz Elements Void, super rare Ampeg Scrambler fuzz. Input Sensitive circuit generates lots of even order harmonic overtones to provide a unique Octave/Fuzz sound that can then be mixed, Dry Signal Blend. Overtones are Dynamic and Frequency Dependant, changing constantly as it tracks different by picking styles and alternate positions on the fretboard. True Bypass Switching lets your instruments signal pass through a non-electronic bypass line when the effect is disengaged, feeding your amp with direct, unaltered signal from your instrument. Operates with 9V battery or standard AC adaptor. Input Impedance 150k ohms • Output Impedance 10k ohms • Maximum Gain 28dB, 1 kHz • Input Noise -106dB or less. Input shorted, IHF-A weighted • Power Consumption 9mA max • Battery Life 9VDC manganese battery 57 hours 25 deg C FUJITSU 6F22 • 9VDC alkaline battery 86 hours 25 deg C TOSHIBA 6LF22 • Dimensions 70×113×56mm • Weight 320g.